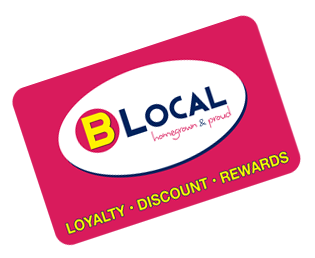 B Local membership is 100% free. Anyone can request to join at any of our participating stores and will be able to sign up within a few minutes. There is an initial payment of €199 which includes your first 200 cards and the mobile scanning device. The first month of use is FREE. The monthly subscription then begins at €39 per month. That’s a setup fee equal to the cost of a small mobile phone and the cost of 4 cups of coffee a week to achieve real customer retention! 200 high spec NFC encoded B Local loyalty cards. Customised integrated back office platform and reports. Customised business online presence on blocalcard.com. The facility to build and grow a valuable database of loyal customers. Entry to a growing network of forward-thinking local businesses. Access to a growing network of new and motivated customers. Full training and support – Your success ensures our success. Pricing starts at €39/month, less than €10/week! We believe we have the most affordable and most equitable price structure in the industry. Our customers expressed their gratitude, it has been very worthwhile! B Local is very easy to operate and very user-friendly. B Local is the locally focussed, small business loyalty program that helps you get on with the business of growing your business. B Local is quick and easy to set up, runs effortlessly, day in and day out, and allows you to grow your own database of loyal customers while taking advantage of our growing community of over 30 000 existing members.